Inspired by the classic horror movie by George Romero, this graphic adventure game takes place in a supermarket invaded by the undead. 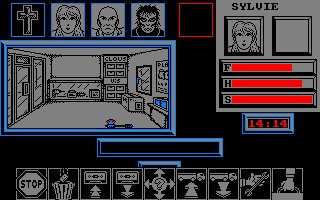 You lead each of the four characters who have landed on the roof of the building and you must find several items to escape from a horrible death. Featuring good graphics and a clever gameplay, Zombi manages to be both scary and funny. Using a point-and-click interface, you have a great variety of actions to accomplish. The fight sequences aren't as good as the rest of the game (you must strike a key as fast as possible) but there many things to discover and a lot of places to explore. The title screen is great, by the way! You are docked on an island that has been overrun by zombies and you must escape – but once you do, the nightmare is not yet over... 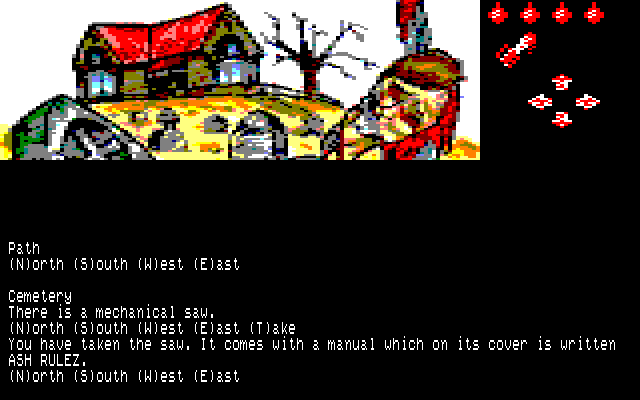 The plot of this text adventure game is interesting and the graphics accompanying the text are well drawn. The game has two parts, with the first part taking place on an island, and the second part taking place in the city of San Dario, which is under military control. It is not a very big game but its theme is attention-grabbing. As in most games of this genre, there is no sound. It is also a difficult game; patience will be appreciated! To sum up, text adventure fans will have a nice zombie hunt out there. Tron – it's a classic game, but what can you do to make it more interesting? 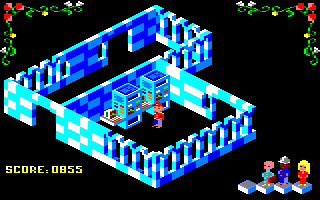 This version of the well known game adds some excellent graphics, fifteen different zones (most of which have their own unique layout), and let the player view the game in isometric 3D. The result is marvellous. Starting in zone 14, you must trap your computer-controlled opponents so that they crash in order to progress to the next zone. The speed of the game, and the tight confines of some zones, make this rather difficult, but the computer tries to use the same methods every time you play the game, so you'll need a good memory – and some luck! The graphics are great and so is the music. A spaceship has crashed on another planet, and you're the only crew member who has been awoken from a state of suspended animation. You alone must explore the planet and find six plasma limiter pods, otherwise there will be a big explosion! This is a standard arcade adventure game in which you must explore all the terrain and shoot aliens. Most of your time is spent flying around the planet, but there are some sections where you can explore on foot by entering an airlock. The graphics, music and sound effects are all very good, but the plot is unoriginal and the simple, derivative nature of the game won't hold your interest for long. 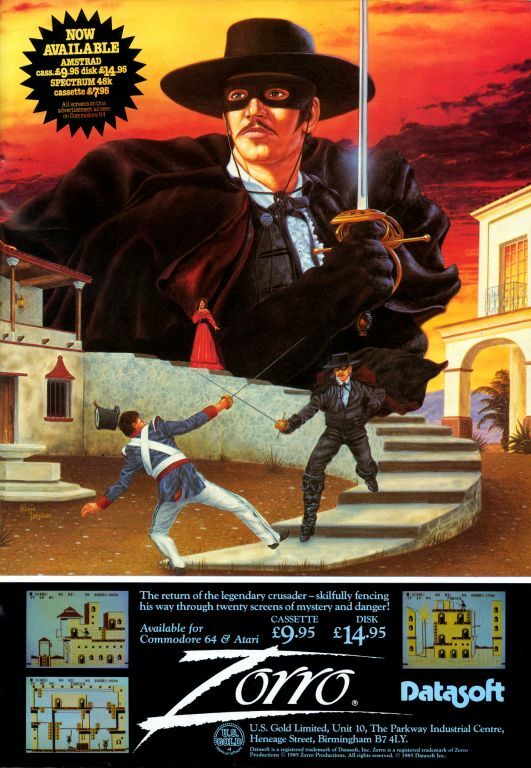 The computer version of Zorro is a platform-style adventure where you battle along in your quest to rescue the señorita. Colonel Garcia is holding her prisoner within the tower of his fort. 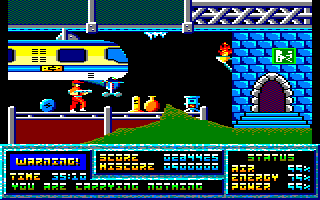 Using a similar game engine to Datasoft's other platformer Bruce Lee, Zorro must climb, swing, collect objects and spar with the Colonel's guards. Its difficulty level is set just right, meaning that anyone can load this up and gain some enjoyment from it. The graphics vary in their appearance from screen to screen but still look a little dated. A short tune repeats endlessly but it isn't too irritating. Zox has kidnapped four inhabitants of the planet Hullm, and they are imprisoned on his asteroid. Of course, you must rescue them. There are two parts to this rather nice game. The first part is a space shoot-'em-up where you must avoid being hit by the green bullets that are fired by the spacecraft flying towards you. If you manage to reach the asteroid intact, you then enter a maze where you must locate the prisoners while avoiding the guards, which you can stun temporarily with your laser gun. 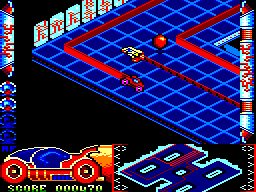 By the way, some of the walls in the maze can be moved... At first, I wasn't overly enamoured by the game, as the shoot-'em-up section is basic and repetitive, but once I reached the maze, it became more enjoyable, especially with the colourful graphics. The King of Zub has sent our hero Zub on a mission to retrieve the green eyeball of Zub. 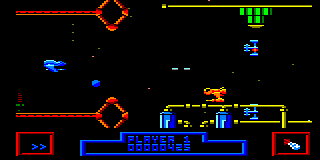 Starting on Zub 1, you have reach Zub 10 by using the teleportation platforms located above each of the ten planets of the Zub system. When you've got the eyeball, you must then teleport your way back to Zub 1. You make your way to the top of each planet by manoeuvring platforms left and right, although you must crouch in order to move them properly. There are robots on each planet who will attempt to push you off the platforms, but you can shoot them. The team which programmed the game are completely mad – they must be with such a ridiculous plot – but it's a fun game with good graphics and music. Unfortunately it crashes on the higher difficulty levels, which is a shame, because the lower difficulty levels are too easy. 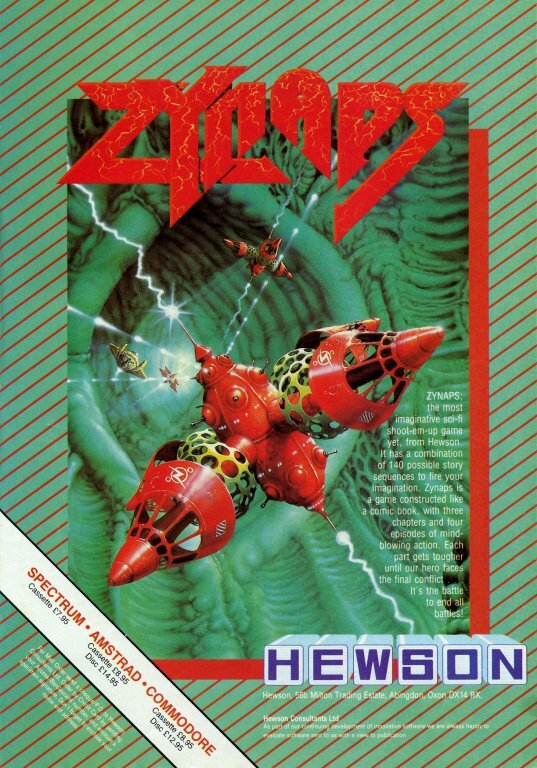 A no-nonsense shoot-'em-up from the creators of Uridium, this is a more Nemesis-style state of affairs, with simple side scrolling action as you guide your trusty spacecraft against marauding alien crafts and defences along a space-based environment that flows quickly past you. Swatting the enemy ships is relatively easy in itself, but avoiding the protruding landscape and fire from the defences makes this a much tougher proposition, especially as you have no control of your speed. Thankfully, power-ups are available to pick up along the way, as you encounter even larger, better protected vessels and asteroids. So while it isn't an original piece of gameplay, it does have some very colourful, pretty graphics, charming music and funky sound effects all in its favour. Watch YouTube videos of this game by: Axelino, ZEUSDAZ.